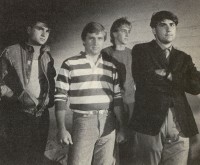 4.4.1.: The gone-but-not-forgotten band from the '80s alternative rock underground - 4.4.1. The recent publication of the book God's Not Dead (And Neither Are We) by Jerry Wilson gave fans of '80s Christian rock a veritable feast of information with interviews with Undercover, The Altar Boys, Barnabas, The Choir, the 77s and many more. One of the bands chronicled were Southern California's 4.4.1. who CCM magazine once claimed made music that would "appeal to all fans of such new rock as U2 and Simple Minds" and who enthused "if the rest of the country likes them as much as Southern California audiences have, they will soon be one of the hottest Christian bands around." As it turned out, 4.4.1. were never quite that. But they were bold alternative rock pioneers whose 1985 '4.4.1. album is crying out for a CD re-issue and, more than that, who lived and performed in a tumultuous time which saw Christian alternative rockers confront the conservative and some might say ungodly gatekeepers in '80s Christian media. In the God's Not Dead book lead singer John McNamara recounted his early spiritual influences. "My mom and dad were broth brought up in the Catholic Church. My mom's maiden name was McNamee and my dad's mom was O'Brien. There was a very strong east coast traditional Irish Catholic commitment in my family. I went through all the steps of Confirmation and the sacraments. Then I met the Giali brothers (guitarist John Giali and drummer Steve), who lived about three houses away from where I grew up. They had been brought up Catholic, but their dad had become a believer through a charismatic movement in the Catholic Church when they lived in Chicago. Eventually they moved to southern California, so I had four Giali boys I could play with and I was over at their house every day. Their dad had a Bible study that he actually led through the Catholic catechism. I heard about Christ in Joe Giali's living room when I was about 14 years old. That's when I first truly understood the Gospel message, and I made a commitment to Christ in 1975." As to early music influences, McNamara recalled, "I'd always been interested in music since I was a little kid. Steve and John Giali both had massive album collections plus high tech stereo systems, and since I was over there all the time I learned about all sorts of popular music. Loved the Beatles and The Who. The mid '70s were a great, fun time for music. We'd sit in Steve's room where he had his drum kit set up, turn on The Who, and he'd play like Keith Moon. That was the first time I'd ever seen a real drum set. And Steve played very loud." By 1984 the musical friends had roped in singer and bass player Glenn Holland. Slowly their occasional rehearsals developed into something more serious. Remembered John, "We started to see whether we could write some songs. I set some out, and Glenn said he had some ideas. So we got together and over about two weeks we ended up recording a demo. I think all the songs from that went onto the first album: 'Love's Irony', 'Mom And Dad', 'Break Out' and others. Glenn had the equipment to make cassette demos. He had a little four-track mini-studio with all the microphones set up. It was pretty simple for us to do it. It was a lot of work for Glenn, but as for the rest of us all we had to do was come and perform. He would mix it and make it sound good - they were original songs and we thought we performed them well - so we mixed the demo and made a bunch of copies. We sent them out to 20 people and got one response. That was Randy Ziegler from Calvary Chapel of Costa Mesa. He introduced us to Harry Barnes who was looking for a new band for his record label. He had enough money to make an album, so we went down and met him in Costa Mesa. At that point we had to make a decision about should we do this. We decided we wanted to. Within a month we were recording our songs. So, it happened quickly. In my mind that's when it gelled. We all made a commitment to make an album, and that was a lot of fun; a dream come true." At that time radio station KYMS was the nerve centre for Southern California's contemporary Christian music scene, with a pop music format veering into the more adventurous side of things come Saturday night. The band's album '4.4.1.' was released on Harry Barnes' fledgling label Royal Commandment Records. KYMS latched onto the song "Break Out" which, extraordinarily, rose to the top of the station's charts. How did McNamara see all this? "It was surreal. I couldn't believe that it got airplay and we had the most popular song on the station we actually listened to. It was weird in that I'd been going to Christian music concerts. I loved a lot of the bands and the performers, like Randy Stonehill and Larry Norman and The Way and Love Song. The music was great. But I was in the audience. All of a sudden, we were there performing at Costa Mesa, had our songs on the radio, and had an album released. It was overwhelming having popular people like the songs. It was unexpected." Remembered Glenn Holland, "It was one of those experiences you'll never forget, hearing your song on the radio and the DJ saying it's the number one song. Even though obviously we're talking about a sliver of society that's about the width of a hair, it was still a lot of fun. So we got to play more Calvary Chapels and churches. The scene was on fire; very special, very vibrant. We certainly weren't the first band doing this kind of stuff. I always bring up Undercover, Altar Boys, Lifesavers. We came a little after that. Not a completely different feel, but it was very vibrant and rich. There was a lot of excitement, a lot of big gigs." 4.4.1. played at Calvary Chapel, Costa Mesa, "around 15 times." But then problems began to emerge, from an unexpected corner. Randy Ziegler arranged for the band to have a meeting with Chuck Smith, the legendary pastor/evangelist who had been at the epicentre of the Jesus Movement of the early '70s which had birthed the whole contemporary Christian music scene. Chuck's Calvary Chapel church in Costa Mesa had started the whole movement with the groundbreaking Praise worship albums and acts like Love Song and The Way. But by the '80s mainstream pop and rock had changed hugely from the soft-rock sounds of '70s California. And Christian youth were reflecting these changes. Pastor Smith was highly suspicious of the emerging Christian underground where bands sported tattoos, torn jeans or Mohicans while proclaiming their love for Jesus. Glenn vividly remembered the meeting with Smith. "He liked us because, and this is something he brought up, we looked the part. We didn't have tattoos; we didn't have Mohawks. I remember at the time I had a bleached tail hanging down my back. It was rather thin, and I remember right after that meeting during which it was tucked into my shirt, I cut it off. I think all he wanted was to get control of the situation, or at least validate what they were trying to do. So he met with us and said, 'I want to design a programme that centres around you guys. You are going to be our band.'" Peculiarly, despite the promise, nothing happened. And, as it turned out, Calvary Chapel began to stop booking 4-4-1 and, for that matter, just about all the new wave of bands who with their punk and glam appearance and sounds were musically and appearance-wise a long, long way from the converted hippies of the '70s. It took a while for Calvary Chapel's gradual pulling back of support for the underground to take effect. As Glenn Holland remembered, by 1983 the California Christian underground was working pretty effectively. "It was growing. It was working. More and more stations were playing bands like ours. Generally there was more contemporary Christian music playing, but the bands we're talking about were a little more fringe than that, and even those were getting more play. When Harry Barnes retooled Royal Commandment Music - that was the name of his label when we did our first record - and got Undercover and Adam Again, I worked for him and basically did the marketing [for the company, now renamed Blue Collar Records]. We had three bands coming out with three records right around the same time, and we got singles out and records out and everything. All three of those records showed up on the CCM Top 40. We were getting real solid airplay for what Christian music airplay there was. It was there, and it was selling records." Now based in Los Angeles, and with national distribution provided by Light/Lexicon, Blue Collar Records released 4-4-1's 'Mourning Into Dancing' in the summer of 1986. Produced by the Pakaderm Company (headed by Kansas veteran John Elefante and his brother Dino), 'Mourning Into Dancing' had a slicker sound than its predecessor. Said Holland, "It had a sound that was much more produced and in line with what a more mainstream station would play, because our first album sounded a bit more underground, kind of low budget, which a lot of people like and actually in some ways has worn better than 'Mourning Into Dancing' which sounds a bit dated because of the big drums and stuff. But, there was no reason material-wise not to have played several songs off that record." But, as it turned out, 'Mourning Into Dancing' didn't get the airplay it deserved. Continued Holland, "KYMS changed their format. They were playing a lot of this stuff. Before we got our songs out they were playing things like Undercover. They had a specialty show on Saturday night. As part of their regular rotation they were starting to play Undercover and some of these other bands. We got on there . Then, just as our music started coming out, they started changing. They played 'Is It Enough' for a few weeks and that was it. They didn't even play a song which made it to number two on the Christian rock charts nationally. Why they didn't play that song was an absolute mystery to me, but they were already retooling the format to go back to a more conservative CCM, almost adult contemporary repertoire. They wanted only 'big' acts." With the forces of conservatism re-asserting their hold on Christian radio, gigs for underground acts like 4.4.1. were drying up fast. John and Steve Giali had had enough and left 4-4-1 And Blue Collar Records folded after the struggling Light/Lexicon failed to pay them for the albums they'd distributed. A new company, Frontline Records, momentarily seemed to be the saviour of the underground releasing numerous albums by a welter of underground acts. But their "support" of the underground was hardly that. Said Glenn Holland, "Once Calvary Chapel started pulling back, and MRC went away, Frontline started with a decidedly different business model which was basically that of a record producing machine pumping out as many records as it could hoping to sell 9,000 of each, not pay the artist anything, make some money, then get another record out and another, that all started breaking down." Commenting about the state of the CCM industry John McNamara is particular outspoken. "There's a core control group. It's an industry run by these guys who run the record companies. When we started to meet these people and talk to them about what they offered for record deals and that kind of thing, reading the contracts, we realised it's not a very fun industry. It is very cutthroat, with a lot of jealousies and not many reassurances for the artists about what they'll be doing and when. It's a strange industry. And you don't find a lot of artists who can stand it for a long time. There's only a few. On balance, I would say it's messed up. In some cases, extremely messed up with unscrupulous people who were screwing people and who should be put in jail. Whether they were Christian or not, what they did was horrible. They hurt people, but that was an acceptable type of behaviour in the industry and more normal than not. How can an industry survive that way? It's unbelievable." Without the Giali brothers, Glenn Holland and John McNamara continued on with the 4-4-1 name a while longer. In 1988 now sporting a more acoustic sound that critic Quincy Newcomb compared to albums by Crowded House and Simple Minds, 4.4.1. released the 'Sacrifice' album for Broken Records. Said McNamara, "We had connections with Joe Taylor and Gene Andrusco, and they came up with the idea that we could do some more songs. So we ended up doing that. I don't know if it was a good idea or not! It was the last stage of that time." A couple of years later the original quartet momentarily reunited in an effort to revive things as an active group. Said Holland, "We had some new songs, and it seemed like the cycle of music had gone through another cycle. But it didn't take off. Then we all started having kids, at which point in time your world shrinks. Careers get more demanding; that sort of thing. It's harder to get together in a band sort of way. But we kept in touch." McNamara added, "When Glenn comes out (Holland now lives in Texas) and we can play together, it's fun. It's like what we did when were in junior high or high school. We like to get in the garage, turn the amps on, and play. It's got a basic appeal. It still is that way." In August 2005 4.4.1. re-formed once more to play at the Broken Records Reunion Concert in Southern California. By all accounts it was a stunning event and the interviews conducted by Jerry Wilson form the basis of the God's Not Dead book and this article. McNamara summarised his memories of those heady days when 4-4-1 were at the height of their popularity. "When I think about it, I have a very positive view of what happened back then. We had a lot of positive effect. It was awesome. It was a movement. There would be hundreds or thousands of kids, and it was focused on the Gospel. Our whole purpose was to share the good news and the Gospel of Christ. It was great. It was very positive. And a lot of our songs were that way: very positive. But fast forward to 20 years later. In the forefront of my mind I'm not that connected to it. So, to have people come up and say that time was an important milestone in their life - they were struggling, or went through a divorce or the death of a family member or whatever it was - and that our music and the ministry we had helped them get through that time so now when they look back at it and it was a turning point in their faith. that's awesome. There's a spiritual legacy there of people's lives being changed. I'm glad about that." I cannot my find! I found Sacrifice on cassette and in outstanding condition; only paid one thin dime! For the record, I've re-released "God's Not Dead (And Neither Are We)" in revised and expanded form with a new title: "First and Forgotten." More info available at firstandforgotten.com . I really loved you guy's and I always wondered why you went away!! Now I know. I'm stunned to hear the truth about what happened and why you guy's stopped making music!! Shame on Calvary Chapel and Chuck Smith and the entire CCM music machine!! They may all be saved, BUT Jesus will have a talk with them all at the Judgement seat of Christ!! And he will show them all the souls who WOULD have been saved had they let you guy's continue with your AWESOME ministry!! Thanks for background info on 441. As the weak half of the 2-man road crew for part of that time, I really didn't understand this side of what was happening. I was just thrilled to help and see the results of kids lives impacted by the Spirit through the music. 441 did touch lives, and the song, "Morning into Dancing" got some college play at Pepperdine in 1986 and touched some of the students there in profound ways. It still resonates when times are tough! Thanks for remembering Tony! And very thoughtful of you to pen such a lovely article. Allow me to provide this update that we DID re-master for CD our first two releases and now have them available for sale at www.441online.com. And the Broken Records Reunion Concert you mentioned was recorded, and we have a Live CD of that available too. Thankyou for this article. 4.4.1 will always be a favorite of mine. Tony, thank you for the excellent piece on 441. If people are interested in more info on the band, our website, 441online.com has a discography, lyrics and a store where our CDs can be purchased. Thanks again, Glenn.